iftop is a command line tool that shows a list of active network connections between local host and any remote host, sorted by their bandwidth usage. The list of top-ranking network connections (in terms of bandwidth usage) is periodically refreshed in a ncurses-based user interface. Using iftop, you can visually check the bidirectional bandwidth usage of different network connections in real time. In order to install iftop on Linux, follow the instructions below. To install iftop on CentOS or RHEL, first set up Repoforge repository on your system, and then run the following command. If you would like to build and install the latest version of iftop manually, do the following. 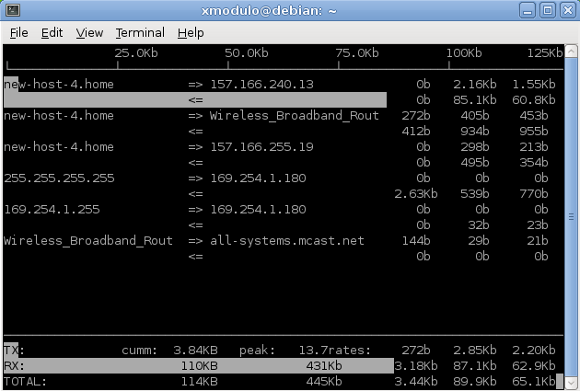 To monitor network traffic received on a specific network interface (e.g., eth0) with iftop, run the following command. To monitor network traffic while ignoring broadcast packets. The screenshot of iftop looks as follows. I'm trying to install iftop on a few centos 6.3 machines using the tar.gz but I keep getting "configure: error: can't find pcap.h". I checked an I have libpcap installed. Any ideas? You may have libpcap installed, but not a dev-version of libpcap (i.e., libpcap-devel) which contains all necessary header files. Make sure to run "sudo yum install libpcap-devel" first, before compiling iftop.